Last year was a wet one for the Miami Valley region, continuing a trend we’ve been seeing for a while now. 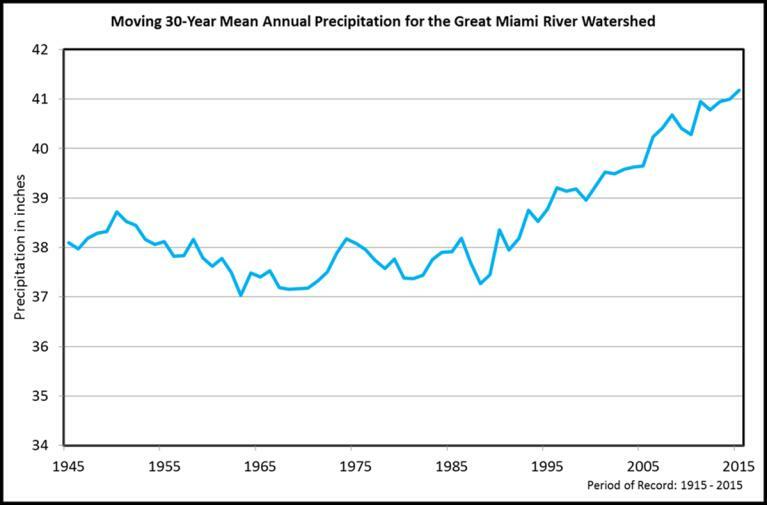 The chart below shows how the 30-year average annual precipitation for the Great Miami River has changed since 1945. Note the upward trend, especially since about 1995.
Notable weather came through our region in 2017, including a very warm February, outbreaks of severe weather in March and May; intense thunderstorms and localized flash flooding in July, a solar eclipse in August, and a cold December. By the end of December, La Niña conditions had developed in the Pacific Ocean, promising to influence the weather we are getting in 2018. 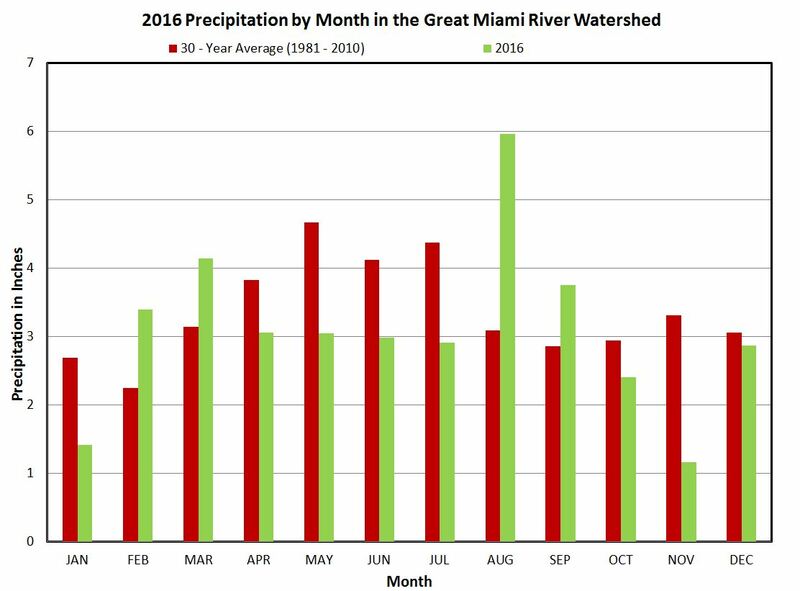 Precipitation for 2017 was well above average for communities across the Great Miami River Watershed at 48.27 inches. This is almost 8 inches above the 30-year (1981–2010) average annual precipitation of just 40.30 inches. 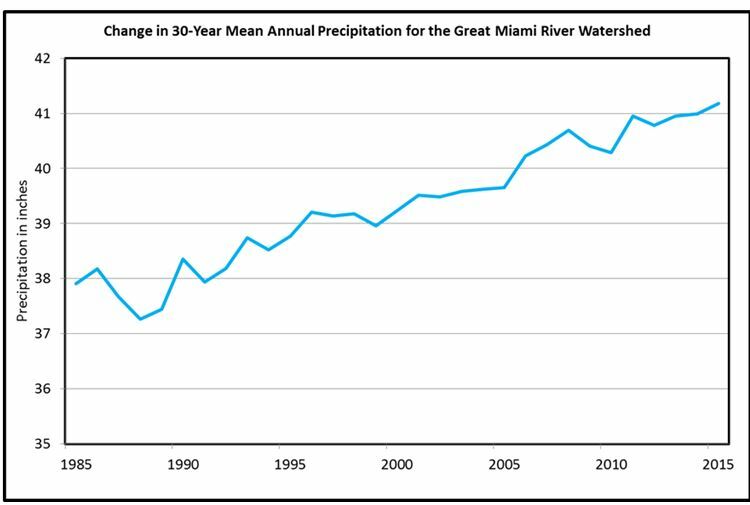 One of the Miami Conservancy District (MCD) observation stations in Dayton recorded 46.28 inches of precipitation, the 18th highest since records began to be kept in 1883. Monthly precipitation was significantly above average in March, May, June, July, October, and November. The months of February, August, September, and December were drier than normal. No record highs or lows were set in 2017. 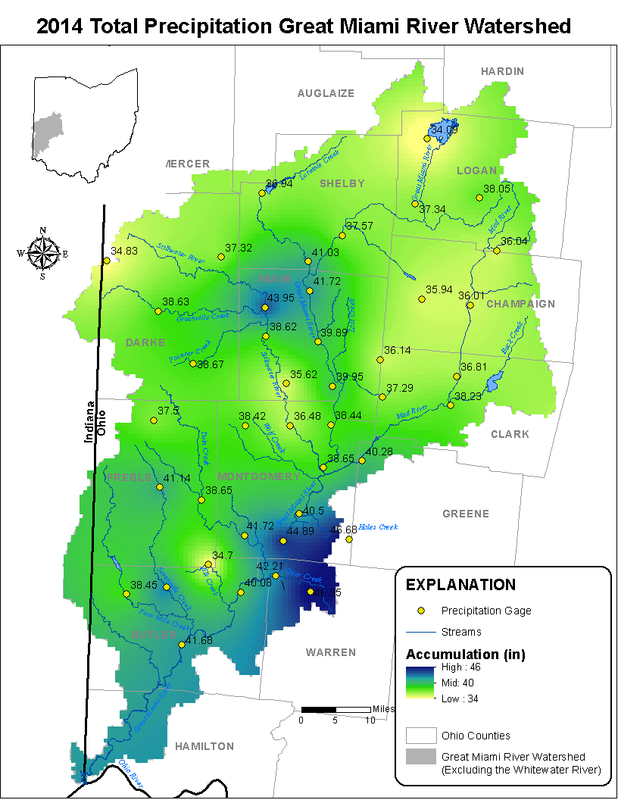 Above average precipitation led to above average runoff in 2017. Runoff is the portion of precipitation which flows downhill and enters streams, rivers, lakes or ponds. 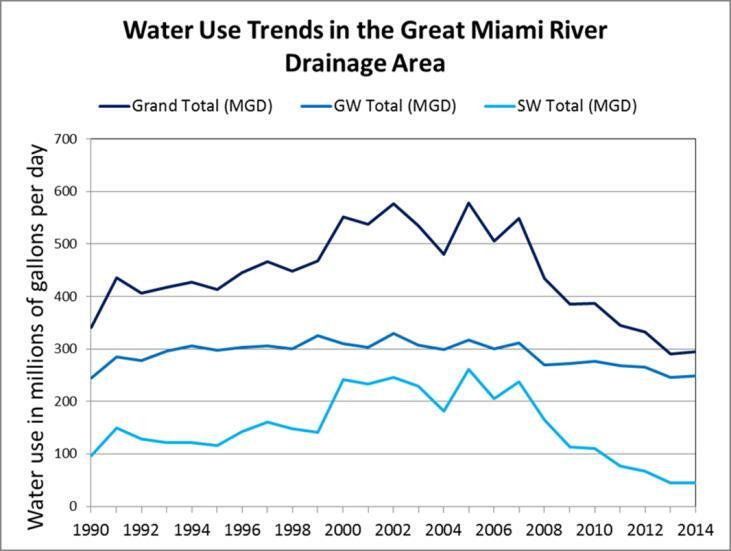 Annual runoff for the Great Miami River was 19.12 inches, which is 4.55 inches above average. Any one dam goes into storage—when the conduits slow the flow of water. This is approximately when the conduits are flowing full. The river at any one of the cities we protect reaches an action stage as defined by the MCD Emergency Action Plan. The largest high water event in 2017 took place from May 4–10 and resulted in peak storage of 30,500 acre-feet (9.9 billion gallons) of water behind MCD dams. All of the dams except Huffman were storing floodwaters.This event ranked as the 60th largest high water event in MCD history. All in all, 2017 was a continuation of the rising trend in precipitation for our region. What can we expect in the future? If the trend continues, more rain, more runoff, and more high water events. With the heavy rains of recent hurricanes, especially Hurricane Harvey’s 50 inches, people are wondering how much precipitation can the MCD flood protection system handle? The system is designed for the greatest reasonably expected storm but not the largest scientifically possible storm. In other words, the system is designed to handle more rain than the region has ever seen but not as much as meteorologists and scientists predict could occur in a worst-case scenario. 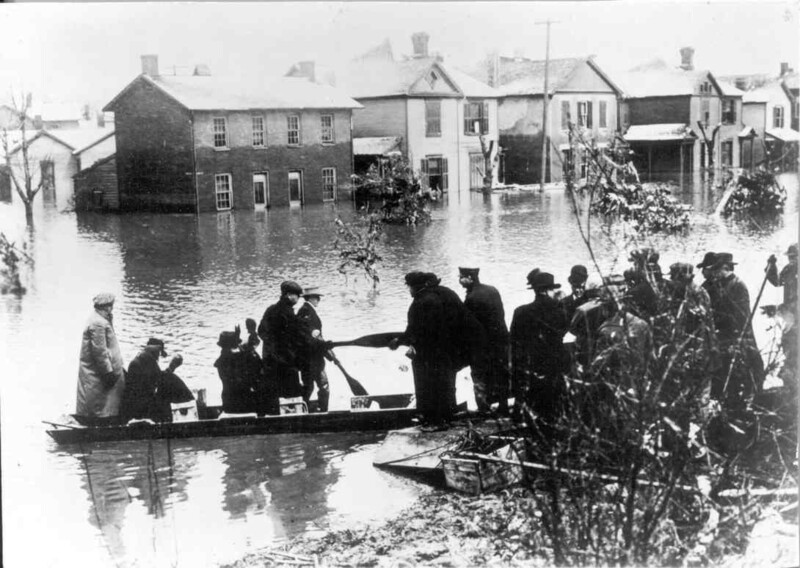 The 1913 Flood brought 9 to 11 inches of rain in three days across the entire 4,000-square-mile Great Miami River Watershed. MCD’s integrated system of five dry dams, 55 miles of levee and acres of preserved floodplain is designed to withstand a storm the size of the 1913 flood plus another 40 percent. Eight to 11 inches of rain fell over the 4,000-square-mile watershed in three days in March of 1913. So the flood protection system is designed to handle about 14 inches of rainfall across the watershed over a three-day period. The two largest high-water events since the 1913 flood were in 1959 and 2005. In 1959, 4 to 6 inches of rain fell between January 19 and 21. In January 2005, we saw 7 to 10 inches of rain in 14 days, plus another 1.5 inches of precipitation in snowmelt from a 15-inch snowstorm in December. In both of those events, there was still plenty of capacity in the retarding basins behind the dams. 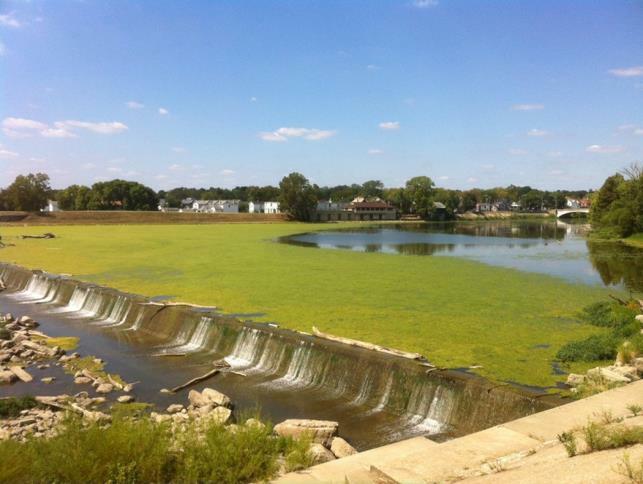 In the 1959 event, floodwaters filled 32 percent of Germantown Dam’s retarding basin. That’s the most any dam has ever held. Based on those numbers, there nothing to worry about, you might think. Which is true. Kind of. A study commissioned by the Ohio Department of Natural Resources in 2013 predicts in an absolute worst-case scenario storm, this region would receive 16 inches of precipitation over the entire watershed in three days. The dams could hold the floodwaters but the levees likely would be overtopped. A study commissioned by the Ohio Department of Natural Resources in 2013 predicts in an absolute worst-case scenario storm, this region would receive 16 inches of precipitation over the entire watershed in three days. This is the most extreme scientifically possible event for our region. If that were to happen, the dams could hold the floodwaters but the levees could be overtopped and flood the cities. The cost-benefit ratio doesn’t allow for us to build a system large enough to handle a worst-case scenario. It doesn’t make financial sense to build for a storm that in all likelihood will never happen. But it is crucial that we continue to maintain our system to handle the smaller storms that could still flood our cities if we didn’t have a working flood protection system. That’s why maintenance, reinvestment and preparation are key. Our dams and levees are nearly 100 years old. Fortunately, MCD has worked hard to maintain the structures over the last century. 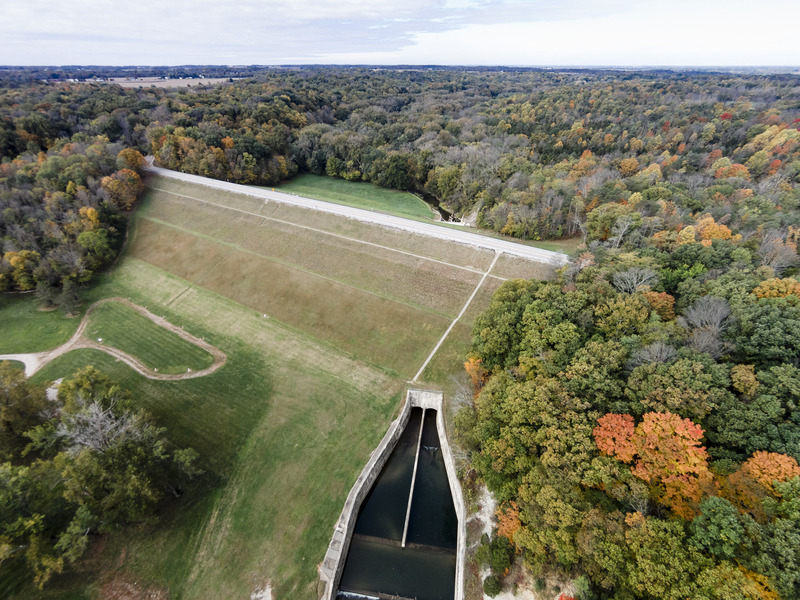 More recently, MCD’s capital improvement project, called the Dam Safety Initiative, addressed potential seepage issues in the foundations and the crests of the dams. We also repaired and replaced concrete floodwalls and revetment. 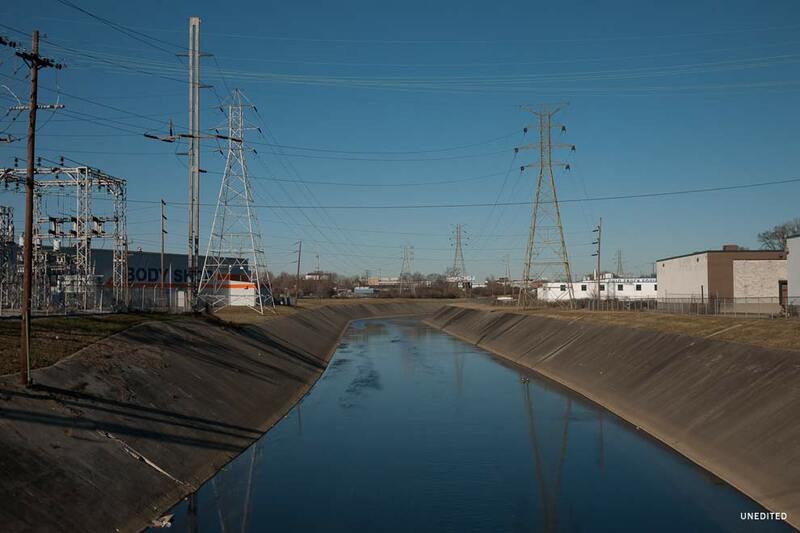 More repairs and investment, however, are needed in the coming years to ensure the dams and levees continue to protect our riverfront communities. 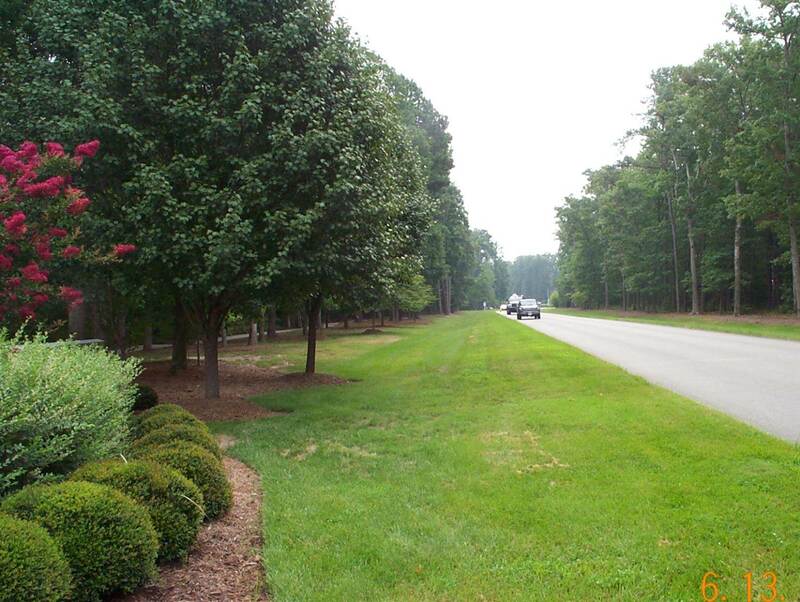 Could your land use plan be holding back your community? It could if you’re not focusing on balancing water protection with land development. This region is averaging about 4 more inches of precipitation per year than it did 30 years ago. Stronger storms, heavier rainfalls and destructive erosion are becoming more common. 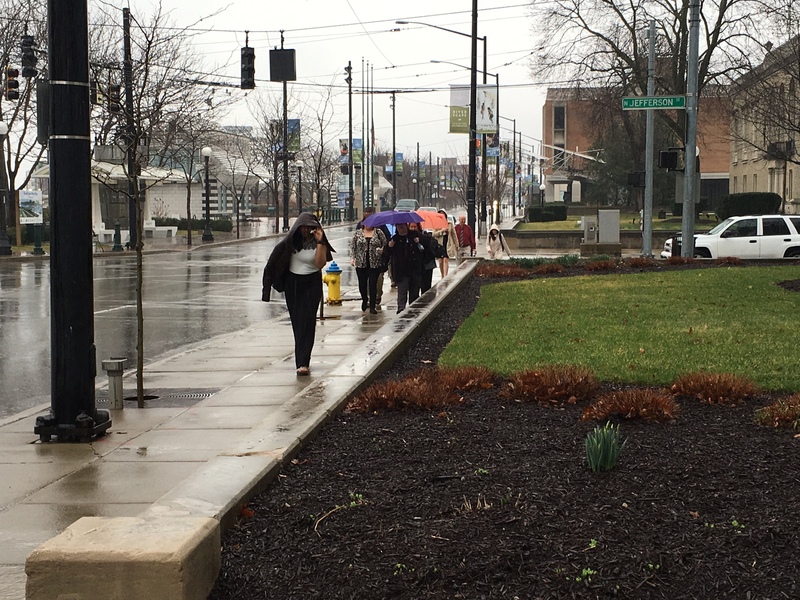 Just a few weeks ago, the region experienced a new record for rainfall for June 14, from 1.29 inches that day to 2.68 inches, according to a Dayton Daily News story. This region now averages about 4 more inches of precipitation per year than it did 30 years ago. Businesses looking to grow or relocate want to be sure flooding isn’t an issue. Communities now more than ever need to focus on protecting their water, and mitigating flooding and peak flows. According to a 2010 study by the American Society of Landscape Architects, governments are wasting billions of dollars a year by not going green. The report looked at 479 case studies of green development projects around the U.S. and found that in more than 73 percent of the cases, the environmentally friendly solution cost the same or less than traditional development. Not only cost less, but these practices can further reduce costs of treating large amounts of polluted runoff. Can help municipalities reduce energy expenses. May reduce flooding and related flood damage. Improve public health — reducing bacteria and pollution in rivers and streams, preventing gastrointestinal illnesses in swimmers and boaters. Seattle Public Utilities found that using grassed channels; combined with narrowing the roadway, eliminating traditional curb and gutter, and placing sidewalks on only one side of the street garnered a cost savings for the city of 15–25 percent, or $100,000 – $235,000 per block, as compared to conventional stormwater control design (Center for Neighborhood Technology, 2010). 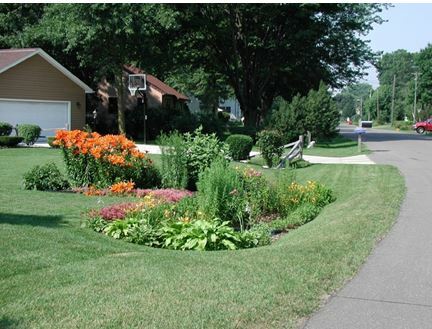 One study found that using green development practices saved 15 to 20 percent in stormwater control costs. MCD can help communities that want to integrate water protection into their land use plans, zoning code, and subdivision regulations. Amending local codes and ordinances is an important first step to achieving a balance between protecting water and promoting economic development. 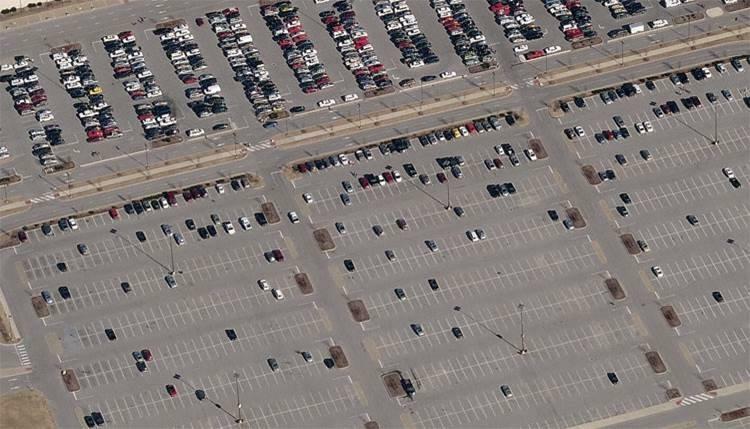 Massive parking lots are impenetrable, creating a barrier to groundwater recharge. All of these create excessive impervious cover, increase flood risk in low lying areas, and provide little room for green space and a natural environment. Incentives for developers to conserve natural areas and consider water protection are generally few and far between. Help comply with stormwater regulations. Reduce erosive flows to streams and rivers. All of the above can save your community money and create a more marketable product. 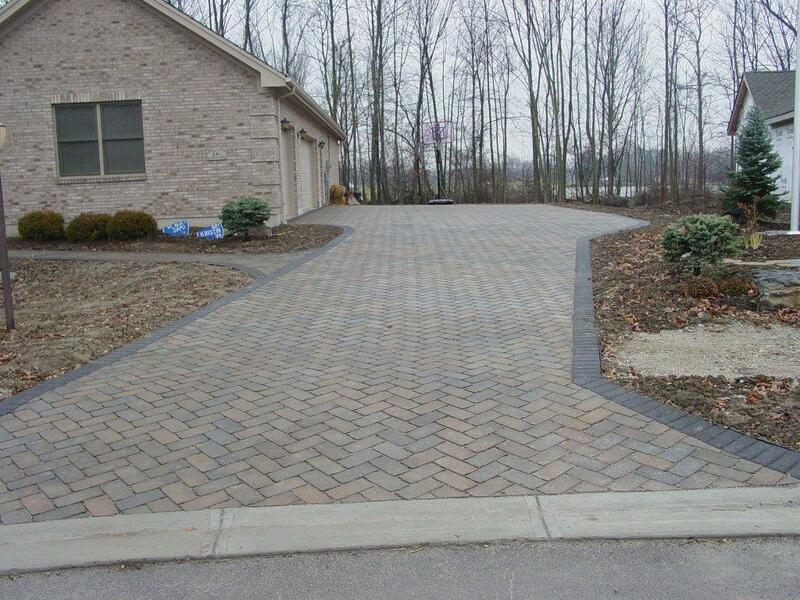 Pervious pavers like this driveway in Brookville reduce stormwater runoff and last years longer than concrete. Using a Site Planning Roundtable, MCD staff can guide a community through a consensus process, bringing together local leaders from government, development, and natural resources. Together, we’ll create development policies that balance water protection and economic development for your community. Compare them to the principles of Better Site Design. Determine if changes can or should be made to current codes and ordinances. Negotiate and reach consensus on what the changes should be. MCD, in partnership with local sponsors, can assist communities during all phases of the Site Planning Roundtable. Call me at 937-223-1278 ext. 3244 and let’s get started! According to the National Oceanic and Atmospheric Administration (NOAA), the current El Niño event in the Pacific Ocean is expected to peak in December, but the impacts of El Niño are expected to last well into the spring of 2016. These impacts are likely to influence weather in our region. When it comes to Earth’s climate, weather phenomena happening in faraway places can sometimes have dramatic impacts locally. El Niño is characterized by unusually warm ocean temperatures in the Equatorial Pacific Ocean. The image above shows areas of the Pacific Ocean with above-normal water temperatures colored in red in August of the 1997 El Niño event and August of 2015. 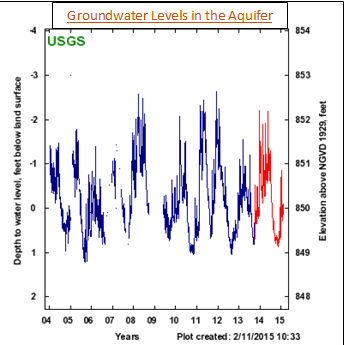 When El Niño occurs, very warm waters in the Pacific Ocean pump more moisture into the atmosphere. This impacts and changes the direction of major wind currents, steering weather systems across the United States. In other words, the typical storm paths in the United States are shifted. 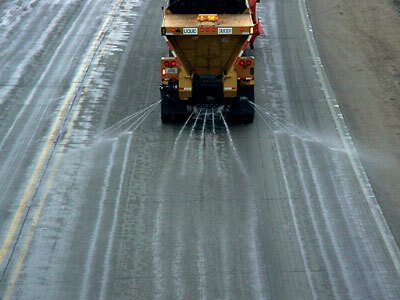 Typically, El Niño shifts storm tracks south during the winter months resulting in increased precipitation across the southern tier of the United States. At the same time, El Niño tends to bring warmer-than-normal temperatures to Alaska, Canada, and the northern tier of the United States. 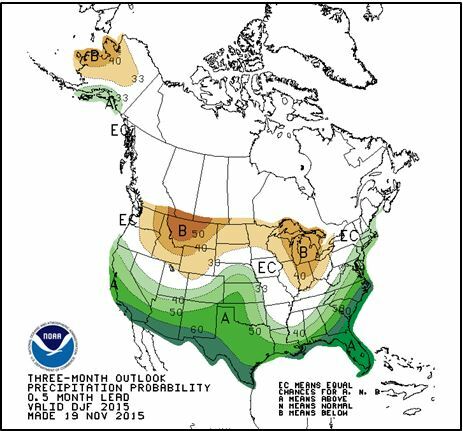 below-normal precipitation in brown over the next three months. Most of Ohio is colored in brown. The outlook for spring is similar, with near-normal temperatures and below-normal precipitation. Is this forecast a sure bet? It isn’t. The Earth’s climate systems are extremely complex, and El Niño is only one of many factors influencing our weather. The temperature and precipitation outcomes we experience this winter are a result of a multitude of complex interactions among the Earth’s weather systems. We can only wait and see!